Mobile phones users are developing rashes on their faces and ears caused by an allergic reaction to the nickel on handsets, skin experts warn. The British Association of Dermatologists said the phenomenon is being seen in people who spend long periods of time on the phone. Nickel is often found in the handset casing or buttons. The BAD said women who reacted to nickel in jewellery were at a higher risk of a rash from their phones. Nickel allergy is the most common contact allergy in the UK and is thought to affect 30% of the population. 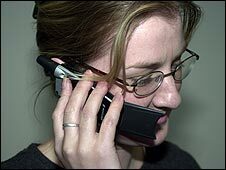 The link to mobile phone handsets was identified in several published case reports of patients with unexplained rashes on their face and ear. Closer investigation revealed that the reaction was caused by nickel in the mobile phone handsets, where it is often found in the casing or buttons, particularly in the most fashionable models. Women are particularly prone to "mobile phone dermatitis", as they are more likely to have been previously sensitised to the metal following an allergic reaction to nickel-coated jewellery, the experts say. The BAD is now advising anyone who develops a rash on their face which might be attributable to prolonged mobile phone use to seek advice from their doctor. It is warning that many cases may go unreported or untreated, which has prompted the scientists to share their findings. In addition, a US study published earlier this year tested 22 handsets from popular brands for nickel, and found it in 10 of them. Dr Lionel Bercovitch, of Brown University, Rhode Island, who was one of the study authors, said: "Nearly half of the phones we spot tested contained some free nickel. "The menu buttons, decorative logos on the headsets and the metallic frames around the liquid crystal display (LCD) screens were the most common sites." He added: "Given the widespread use of cell phones, the presence of metal in the exterior casing of these phones and the high prevalence of nickel sensitisation in the population, it is not surprising that cell phones can cause allergic contact dermatitis." Dr Graham Lowe, from the BAD, said: "The allergy results from frequent skin contact with nickel-containing objects. "Prolonged or repetitive contact with a nickel-containing phone is more likely to cause a skin reaction in those who are allergic. "If you have had a previous reaction to a nickel-coated belt-buckle or jewellery, for example, you are at greater risk of reacting to metal phones." He added: "In mobile phone dermatitis, the rash would typically occur on the cheek or ear, depending on where the metal part of the phone comes into contact with the skin. "In theory it could even occur on the fingers if you spend a lot of time texting on metal menu buttons. "It is worth doctors bearing this condition in mind if they see a patient with a rash on the cheek or ear that cannot otherwise be explained." A spokesman for GSM, the organisation representing mobile phone operators, said many phone models are available that do not use nickel on surfaces. "Some manufacturers plan to phase out use of nickel on surfaces across their product range. "Using a case or handsfree kit will minimise contact to surfaces that may contain nickel."